On Tuesday I went to see the prehistoric drawings inside the caves of Peche Merle. 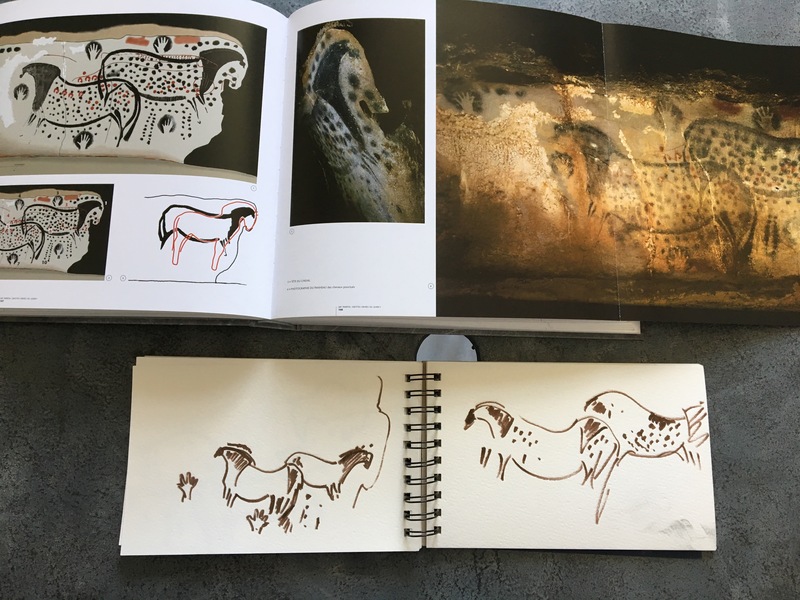 Unlike Lascaux, visitors can actually go down inside and see the original drawings. Many caves with drawings are inaccessible or closed to the public in order to preserve the delicate conditions which have preserved these drawings for millenia. Considering that some of the Peche Merle drawings date from 25,000 BC, this is a privilege. The cave has chambers which are as vast as cathedrals and filled with glistening stalagmites an stalactites. The earth seems alive and I can see how the people who created down there saw the caves as sacred. Their drawings were both abstracted and incredibly lifelike. Simple lines animate the mammoths, bison, deer, prehistoric cattle, and bears. The animals were overlapping in some murals and seems to swirl around each other. I sketched as the tour moved. I had to be quick about because we could only look at each drawing for a few minutes before moving on. 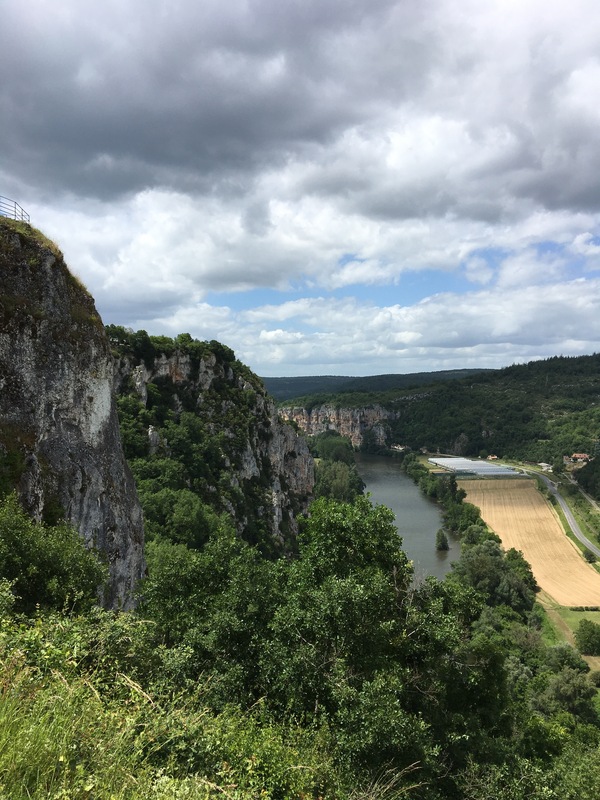 The limestone cliffs above the Lot Valley, where Pech Merle is hidden with its mysterious treasures. I tried to imagine what it must be like to crawl down into a dark cavern with only an animal grease lamp and some manganese and ochre paint. Another haunting feature is the hand prints of both men and women possibly made by blowing the ochre paint around the outline of the hand. Despite the labor intensity of applying the paint and in nearly lightless conditions, these drawings seem alive. Each delineation was economical. The line that made the back of the horse was so simple yet conveyed so much energy. I want to to make lines like that. I hope to capture some of the energy I felt in those caves and express it in my own drawings. The question is how?